Tateishi Park (立石公園) is located west side of Miura Peninsula. It is one of the 50 views of Kanagawa, and when the air is clear, you can see Mt. Fuji from Tateishi. 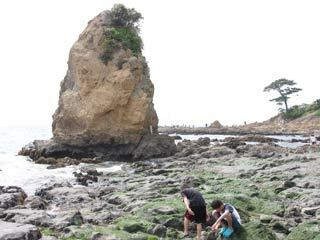 Tateishi is a huge rock standing on Akiya beach. It has 12m high and 30m surround. This is one of the popular photo spots of Mt. Fuji, especially for Diamond Fuji. You can see beautiful Mt. Fuji, when the air is clear. Especially it has beautiful Sunset scenes with Mt. Fuji and beach. It is also popular beach for family activities. On the weekend, many people visit here to enjoy beach.